This is something I have designed and then built in my shed with basic tools. 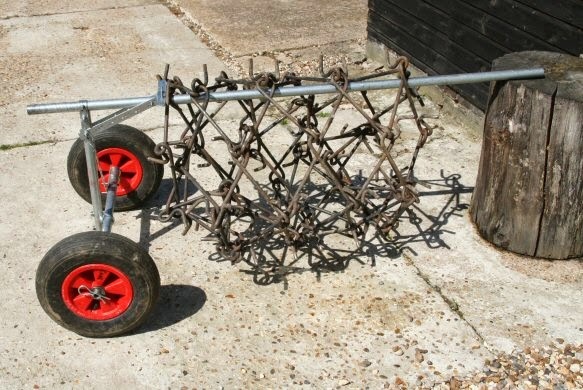 A chain harrow is used a few times a year to improve pasture. 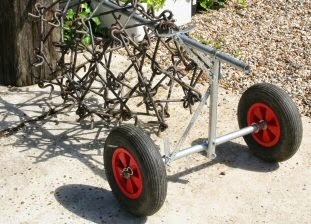 There are several designs but a common type for occasional use is made from 3 sets of chain sheets attached to a bar towed behind a vehicle. Each sheet of chain weighs about 45 kg (100 lbs) making them difficult to carry to and from the fields. This simple trolley makes the arduous task of setting up and putting away much easier. 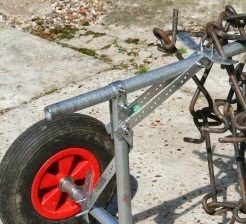 Galvanised steel flat bar, 1"x2"Dia washers, spring clips, U-bolts, wheelbarrow or trailer wheels.